Off in the distance some figures in bright green coats and crumpled safari hats were calling out names in high, shrilling tone: ‘Kitirua’, ‘Alamaya’, ‘Reo’ ‘Lasayen’ and slowly one by one, baby elephants emerge out of the bushes in a single line, trolling and trumpeting, but never forgetting to follow their keepers – a straggled procession of brown faced eager elephant orphans, flapping their ears, wearing a hypnotic grace and fiddling with their curious long trunks. This is the Nairobi nursery of David Sheldrick Wildlife Trust, the world’s most successful orphan-elephant rescue and rehabilitation center. 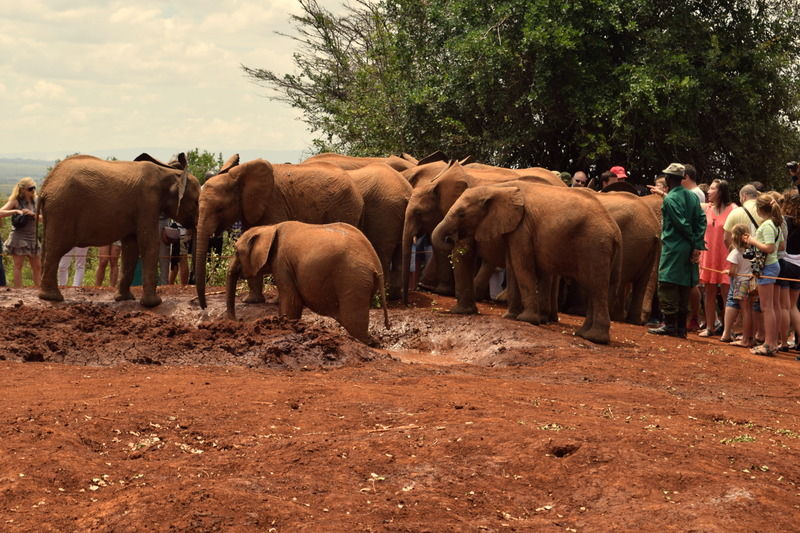 This nursery is a home to orphan baby elephants from all over Kenya, many victims of poaching or human-wildlife conflict, who are then raised here until they are no longer milk dependent. 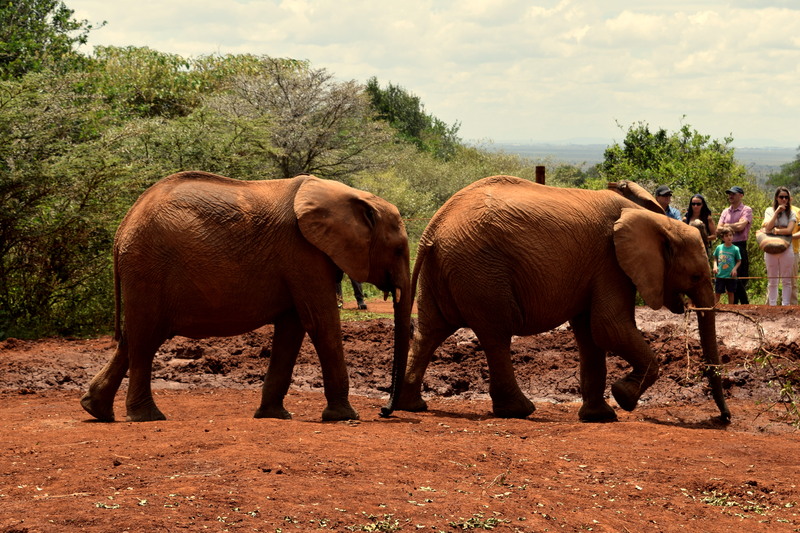 They are then moved over a hundred miles away to another nursery in Tsavo National Park. There at their own pace, usually taking six to eight years, these elephants make a gradual transition to the wild. 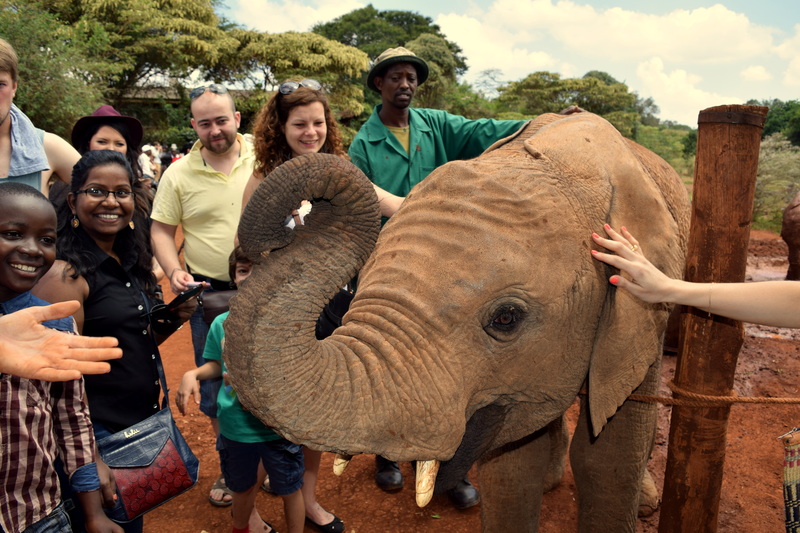 David Sheldrick Trust stands out as a role model in rehabilitation of a wild species and is exemplary to cross-species empathy. 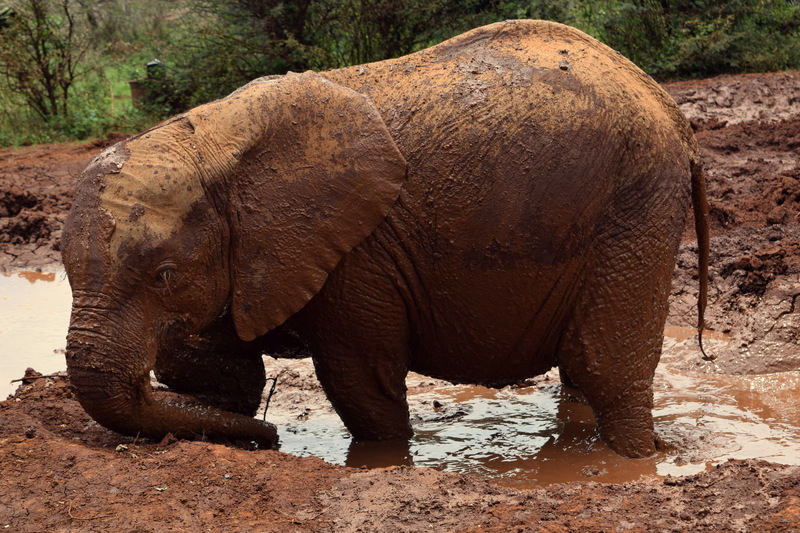 The rampant poaching and wildlife conflicts have become so dire that it has made elephants’ greatest enemies their only hope, and this tricky reality moved a lady Daphne Sheldrick to establish the nursery back in 1987. Daphne Sheldrick is the wife of great naturalist and wildlife wardon of Tsavo National Park Sir David Sheldrick. After his death in 1977, Daphne took the charge of extending services to wildlife, she has reared wild buffalos, dik-diks, impalas, and zebras but elephants have beguiled her the most. The center opens for an hour (11:00 am to 12 noon) daily for visitors during when the babies are brought for their mud-bath, a talk is also organized in this hour. 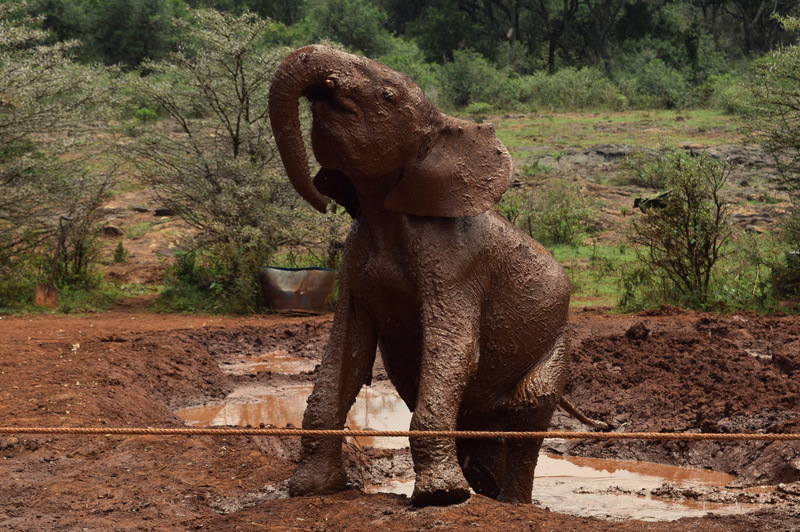 Raising an orphan elephant isn’t easy. In wild babies depend on mothers for milk for two years. Finding a correct formula that can match the nutritional qualities of elephant’s milk is difficult. Over years the trust has learnt important lessons in raising an orphan elephant and preparing it for a smooth transition to wild. This could take upto 10 years and requires a lot of caution as elephants, being social animals, develop emotional bonds with their keepers. To overcome this, shifts of keepers who nurse babies keeps changing and babies are allowed more to mix up with each other. The success of the trust is exemplified in the fact that many of the babies raised in the nursery, are now a part of herds in wild and are raising their own kids. Standing amid a group of orphan, I was struck by their distinctive personality. The talk was on, and the keeper was talking about the elaborate social fabric in which elephants live. ‘They have a genetic memory and are extremely social animals. They know to be submissive before the elders and are instinctively social and caring. When we get a new child here, the others will come and lovingly put around their trunks on its back. Acceptance in a group is instant’ he told the audience as the orphan babies busied themselves in mud-bath. It was like standing with a group of precocious school-kids who having seen some newcomers, and were trying to establish their standing. Often they would come close, lifting their trunks, sniffing, with curious, intense gaze. Elephants are very human animals, they have the same social and emotional traits that we have. Scientists have seen herds visit the grounds where some member of the group had died, for days and at times for months. These babies, who have seen their family getting slaughtered, often suffer from sleeplessness and nightmares and demand great care and love to get settled emotionally. But if elephants can wound like us, they can heal like us as well. 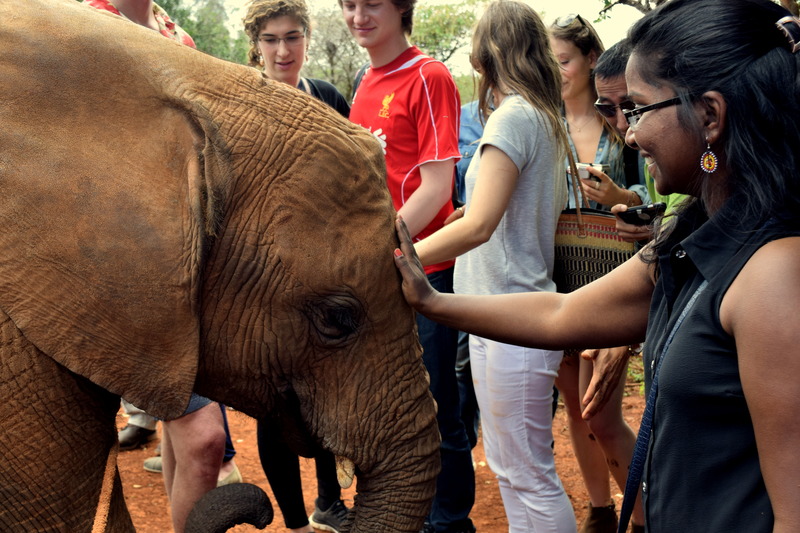 The orphanage also encourages adoption of baby elephants by human parents at a yearly cost of $50. Foster parents are allowed to visit the babies at 5 in the evening when they return from the park and get ready for their evening meal of the milk formula in their individual bottles. While the older elephants are given a picket wood fenced enclosure with generous space, the younger ones live in more enclosed enclosures, often with their keepers. These are sad and perilous days for the largest land animals. The growing demand of ivory in the South Asian especially Chinese markets is spelling a doom on these giants. Unlike Asian elephants, both female and male African elephants have tusks and since males lead a solitary life, it is always easier to poach a female. Standing among these orphans, feeding them leaves and watching them handle their bottle in their trunk or rolling over mud; makes you come closer to realizing the invisible force of nature that binds us all – compassion.